SCAD has made a bold cost-cutting move today by firing their team of professional security personnel and replacing them with work-study students. The innovative plan, appropriately code-named “Students Actively Patrolling” or “SAPs” was the brainchild of Dear Tik’s office of Strategy and Innovation. “It’s absolutely Innovative—and Strategic!” gushed the Mad Turk, “SCAD saves a bundle, and our students get real-world experience while still in school. SCAD Secrets was unable to contact any of the student SAPs currently on security duty for comment. However, we were told by the exiting security team that because of Savannah’s rising crime rate and SCAD’s conveniently placed buildings (scattered around the city in remote and dark locations), the new SAPs will have their hands full as they become the only barrier between students/faculty and the rest of Savannah. 3) A silver whistle, should the SAPs find themselves outnumbered by local ne’er-do-wells. 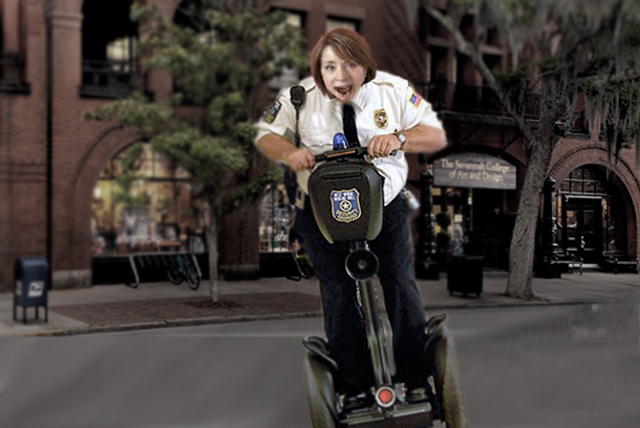 We wish SCAD’s SAPs luck as they, and they alone keep SCAD buildings, faculty and fellow students safe from the mean streets of Savannah.